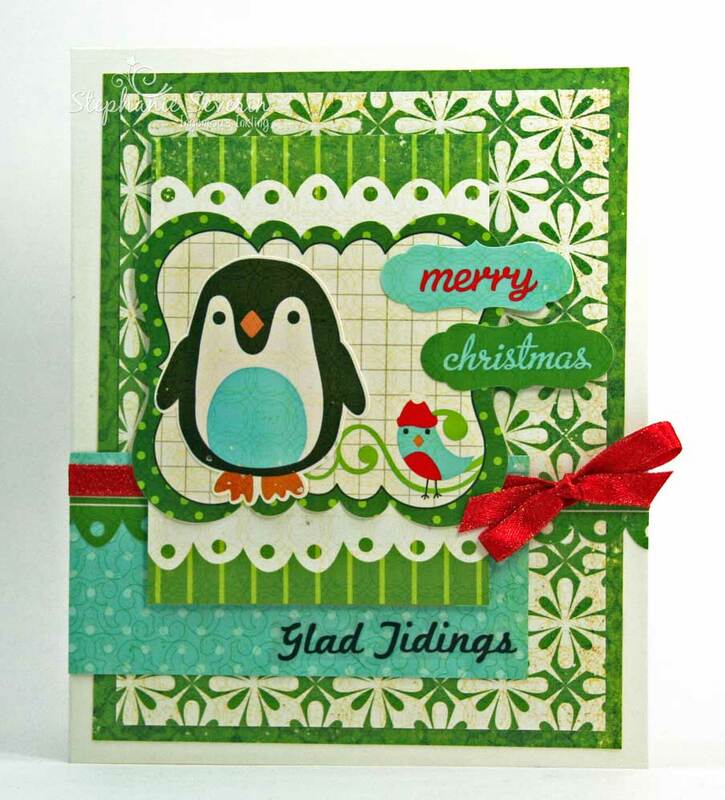 Stef says, "I decided to go with a dual-creature card because my penguin looked like he needed a friend. 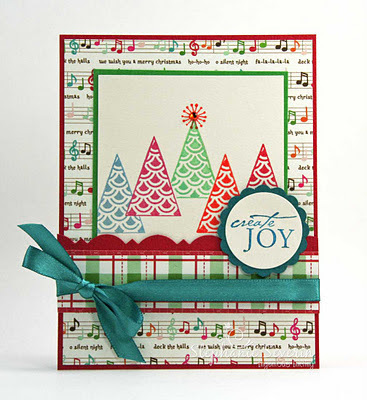 I combined papers & stickers from Echo Park's Everybody Loves Christmas Collection together with an EAD Designs Stickerz sentiment and a wrap of red sparkle ribbon using October's Sketch for You to Try." So break out those critters and creatures and show us your fun holiday card design ... we can't wait to see what you create. Link up here by 6pm (EST) next Wednesday, November 2nd. Keyword for galleries & the Jingle Belles Flickr Group is JB44. We were so thrilled to have the talented Noelle as our lovely guest star this week. We loved seeing all of the different *soft* ideas that were translated into lovely holiday cards. Here are a few that Noelle thought did a particularly fabulous job of translating the prompt. I love this card on so many levels.... Firstly, it's just plain clever with the removable ornament, but then, the color combo blows my socks off! Beautifully rustic, homey & WONDERFUL! 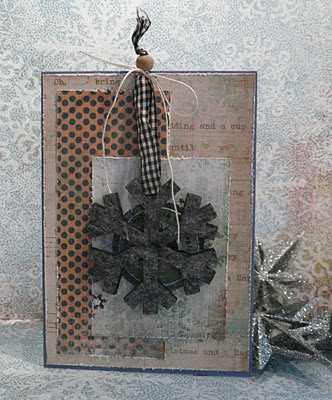 Love the SOFT felt, ribbon, and twine! The soft felt tree, the soft color, the sparkle, and that darling banner across the center of the tree just make it So soft and pretty. 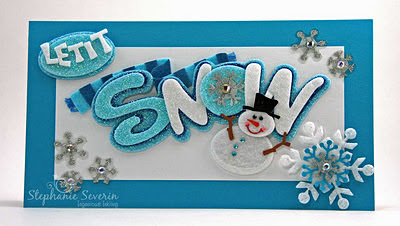 This card evokes a soft feeling, love that! Make sure you check out all of the comfy cushy soft goodness in the jingle belles gallery this week ... and join us at midnight for the next round of holiday card fun. Hi! My name is Noelle & I am a Christmas junkie. No seriously, I am CRAZY about this joyous season & that may have something to do with the fact that my birthday is on Christmas Day. When I’m not caring for my 3 sons, my hubby, or our Pomeranian; you’ll usually find me decorating, baking, and oh yes, CRAFTING! 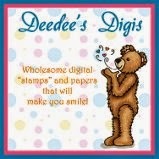 I have a personal blog & I am also on the design team at the ColourQ blog as a scrapper. Sometimes, I also do freelance work for craft manufacturing companies. When I think of winter, I think of: softly falling snow, snuggly sweaters and socks, mittens, down parkas, warm, soft cookies & coziness in general. 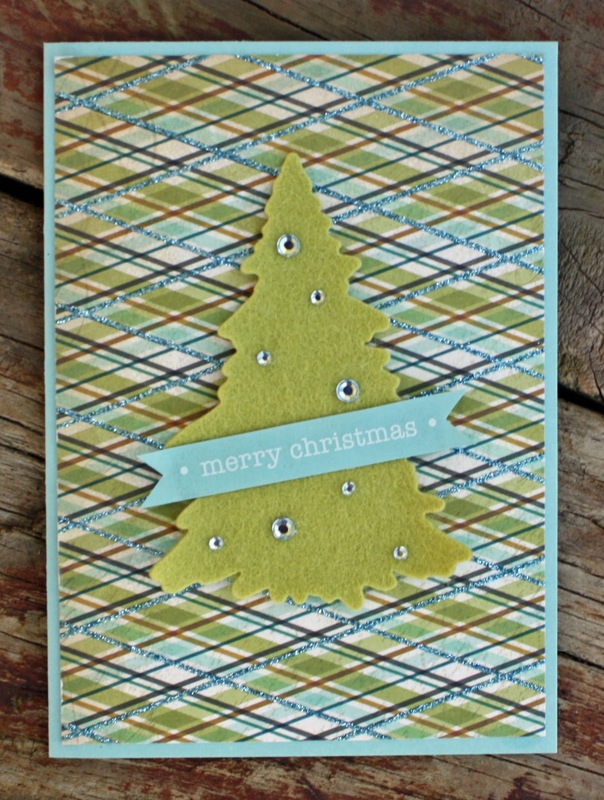 So, that was my jumping off point for this idea of making a SOFT Christmas card/project. I recently learned how to do wool felting & I knew that was something I wanted to incorporate, as well as flocking, ribbon, & stitching. But, some other ideas of SOFT items you could use on your projects this week are: batting, velvet, fibers, denim, thick layers of embossing powder, soft silk flowers and snowflakes, pillow stickers & upholstered brads! Really, anything your brain can come up with that is SOFT, it doesn’t have to be only papercrafting products that you use, either! I encourage you to pull out those quilting, knitting, sewing, & flocking skills! Noelle says, "This project started out with the felt snowflake medallions that you see on the giftcard holder and on the card. I die cut the green scalloped circles from a wool felt sheet. The snowflakes were felted on freeform using wool roving. I have more details and links to felting tutorials on my blog! Wool felting is very simple & I have really enjoyed adding this technique to my crafting skills. The pouch is also felted, instead of being stitched closed. 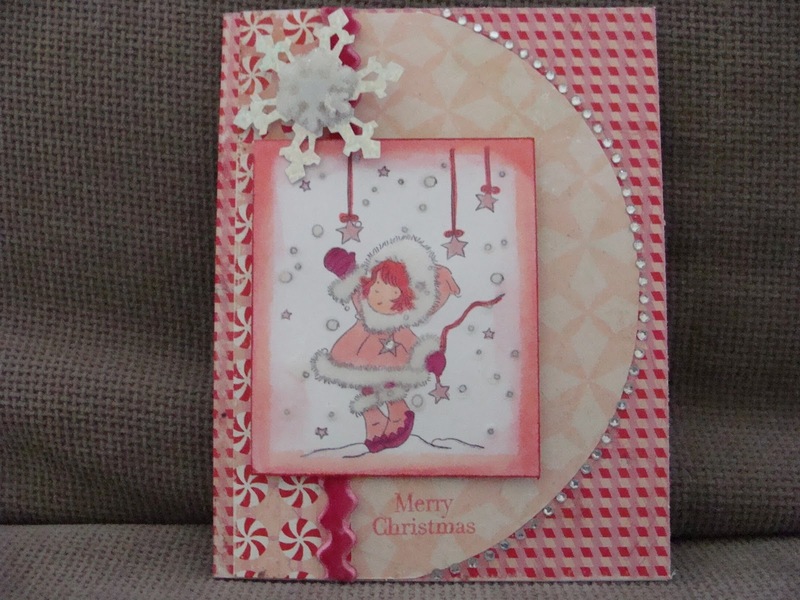 I used some craft felt as my base mat for the card and stitched the cardstock card front to it in the four corners. I gathered some ribbon with a running stitch & adhered that down, too. 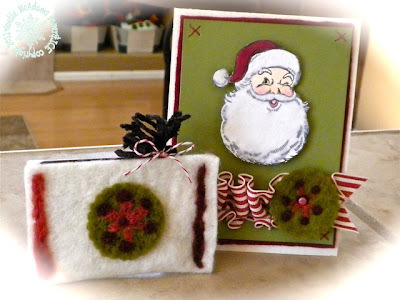 Had to add some flocking to sweet Santa & a tassel made from fibers to my giftcard. I’d LOVE to see how SOFT you get with your projects this week! Thanks for playing this prompt!" Lauren says, "When we scheduled this prompt I happened to mention to Stef that I wassad having used my idea for paper-piecing a sweet reindeer in felt for the "Baby It's Cold Outside" prompt, and thus couldn't use it again. To which my ever sensible colleague immediately replied, "OF COURSE you can use it again!!! Why on Earth NOT??!" Once she said that I realized she's right--a good idea is always open to more than one interpretation and not only is it OK to try out variations on a theme, it's fun, and a great time-saver! 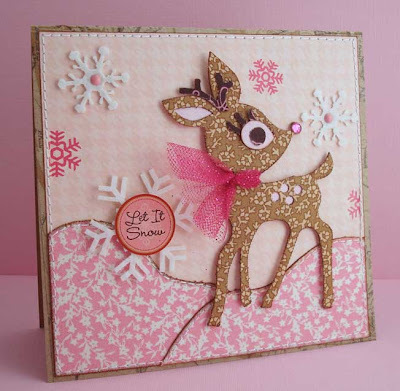 In the meantime I'd bought this adorable Sizzix Reindeer die, which made it extremely easy to cut all the parts I needed from soft cotton quilting fabric backed with index stock. To accentuate the "SOFT" theme i added a jaunty tulle scarf, felt snowflakes, and set the whole thing in a landscape of soft pink fabric and paper!" 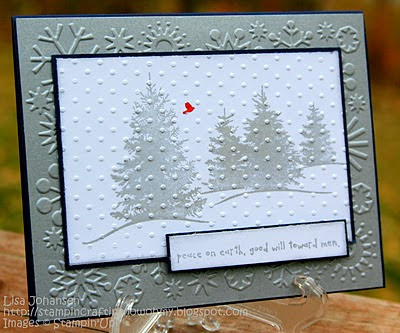 Stef says, "My card started with pre-made glittered felt embellishment stickers from Jolee's boutique (hey, what can I say ... 20% off coupon + sale) that incorporated both the soft & snow elements of the prompt using this week's CPS Sketch. I die-cut my large snowflake embellishment from stiffened white glitter craft felt (I've found the stiffened felt cuts easier), that was then layered with a blue paper-punched snowflake & silver glitter sticker." 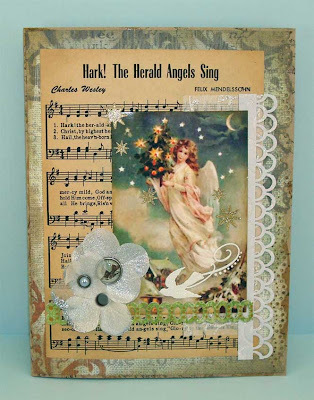 And now it's time to see how ♥YOU♥ will be inspired by the "SOFTLY falling" theme! Pull out some felt, fabric, ribbon, yarn, flowersoft, flocking... or ANYTHING soft and snuggly and get creative! Link up here by 6pm (EST) next Wednesday, October 26th. Keyword for galleries and our Flickr group is JB43. 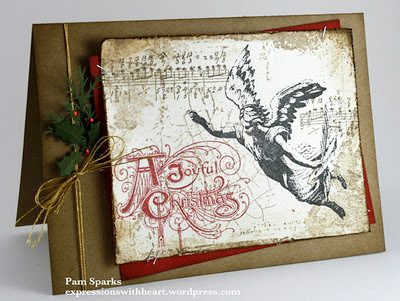 Wowza ... 52 awesome caroling cards this week ... each one unique and fabulous. Thanks so much for singing along with us this week. 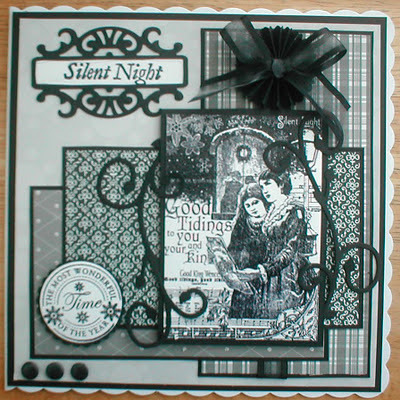 Here are a few we thought interpreted the Christmas Carol prompt particularly well. made us smile with her Three French Hens singing a Christmas carol at the top of their little birdie lungs ... with a fantastic musical background ... and did you see that perfect bow! really captured the peace of a Silent Night. to bring us O Holy Night. 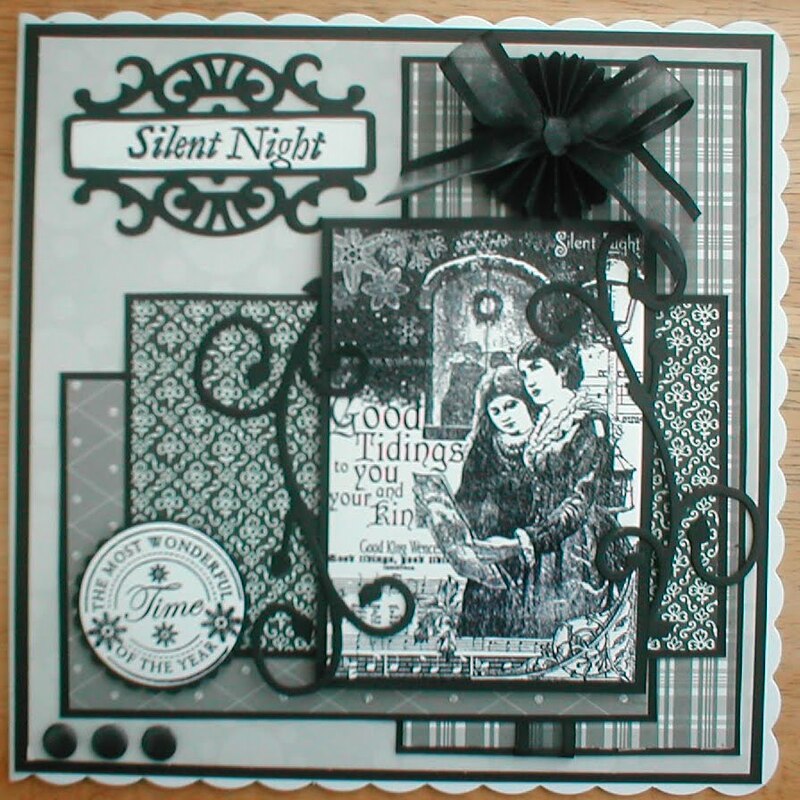 Make sure you check out all of the awesome cards in the gallery & leave a little jingle belles love ... and join us at midnight for another LOVELY Guest Star & creative holiday card prompt. For me, one of my favorite things about the holidays is Christmas Music. I always love caroling with a group, especially when there are people who can sing the beautiful harmonies (I'm pretty much strictly a strong alto melody gal) ... and Lauren & I both have extensive holiday music playlists that we thoroughly enjoy ... we actually had a discussion about purchasing a separate Shuffle just to hold our holiday tunes. While we've certainly used a variety of holiday song titles for prompts this year, this week we're going a little broader ... we're asking you to make a card inspired by any holiday song ... it might be one that evokes childhood memories ... or a more modern tune ... just let us know which holiday song you find inspiring. 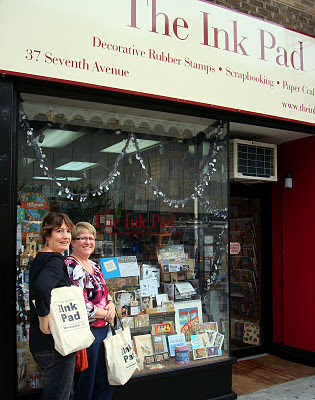 Stef says, "When Lauren and I visited The Ink Pad, we picked-up some fabulous Echo Park Holly Jolly Christmas papers (one of my favorite holiday tunes). Since the FA-LA-LA-LA-LA paper had a variety of holiday lyrics ... I decided to go with a holiday song mix to inspire my card (lyrics on the paper include We Wish You a Merry Christmas, Silent Night, and Deck the Halls). 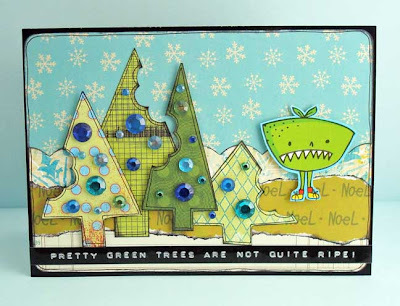 My main image was inspired by Oh Christmas Tree except I used a Hero Arts Friendly Flag stamp & a bit of masking to create my fun & funky holiday forest. Lastly, my sentiment was inspired by Joy to the World. The layout is this week's Freshly Made Sketch." So, we're giving you permission to break out that holiday playlist a bit early ... and find some holiday tunes to inspire you. 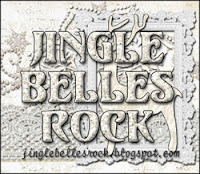 Use keyword JB42 for our Jingle Belles Flickr & other galleries. Make sure you link-up your cards by 6pm (EST) next Wednesday, October 19th. give yourselves a big huge round of applause ♥JINGLE BELLES♥ and take some extra heart-felt thanks from myself and stephanie! because not only have you helped us raise $75* dollars for the susan g. komen foundation--which is utterly awesome--but also, we think you've done some of your BEST WORK EVER! some folks looooooved the pink and others not so much... but everyone ROCKED this prompt in a big way! 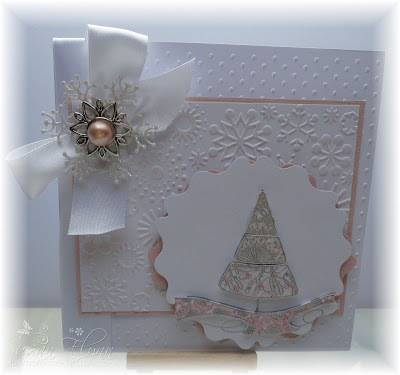 added the merest hint of pink, as an accent, to her completely glamorous and ethereal white-on-white masterpiece! used multiple shades of pink--plus lots and lots of texture and sparkle--in her clever and classy monochromatic confection! 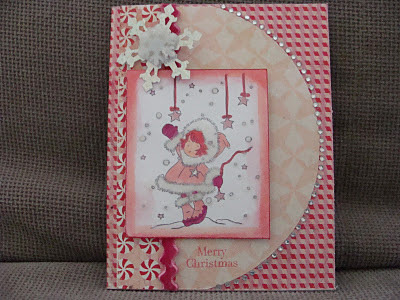 used pink with lots of other brights in her utterly fresh and appealing holiday card! gooooooood morning ♥JINGLE BELLES♥ and welcome to the first official post of october, which as you may know is breast cancer awareness month. which is why, in honor of our sisters, our mothers, our daughters and our friends who have bravely battled --or are still coping-- with this disease, we are eschewing the more ordinary christmas colors of red and green this week in favor of PINK in all its glorious hues, shades, tints and tones! yep, we're asking you to make a holiday card with some pink on it somewhere! don't worry, we'll make it worth your while... because... we'd like this one to be just a little more meaningful... so for every fabulous "pink christmas" card that gets linked up between now and next wednesday night, stephanie and lauren will each donate a dollar to susan g. komen for the cure!!! that's right, $2 a card, and you can enter as many times as you like... but each card has to be newly made, and it has to have some pink on it! 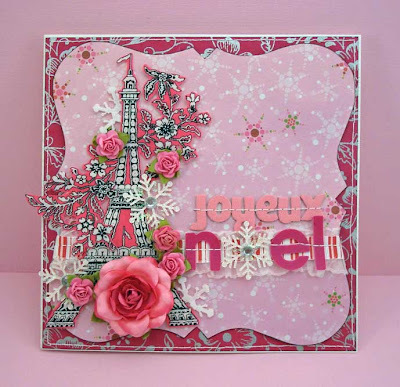 Lauren says, "it's no secret that i like pink... especially on cards... especially on *CHRISTMAS* cards, so this week was pure joy for me! :) i'm not sure how this card evolved into being french, as well, except that i found the pink eiffel tower fabric paper whilst searching for something else and that sort of set the whole thing off. i love it, though; especially since only the snowflakes and snowflake paper are specifically "holiday" products; everything else was regular stash!" Stef says, "I went with the deep vibrant pink of Authentique's Uncommon collection together with a Sketch from the CLASSRoom. 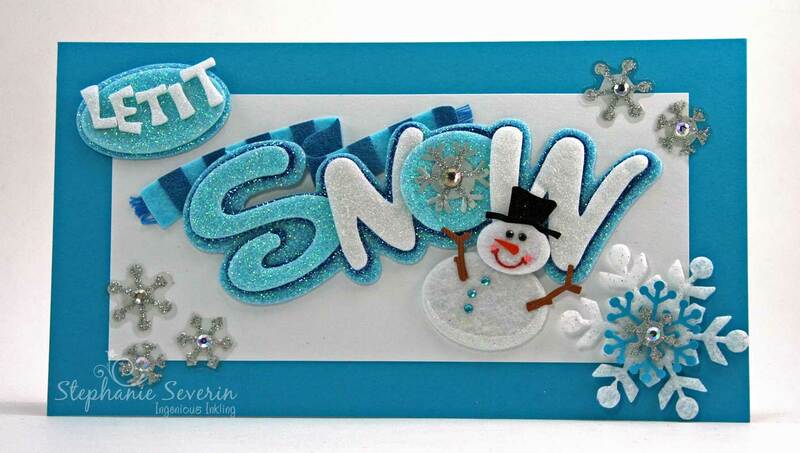 I added EAD Stickerz sentiments and gold glittery snowflakes for holiday sparkle." nothing makes ♥JINGLE BELLES♥ happier than seeing a gallery FULL of amazingly inspired-- and inspiring! --cards. this week, for the peace on earth prompt, everyone seemed to be even more than usually creative and skillful... want to see just a few of the many examples which prove it? assembled this astonishingly lovely collage of ALL NEW ingredients... and then went to town with distressing and inks to make it match her gorgeous vintage image! 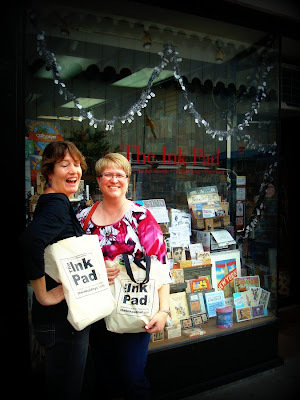 lisa j. of stamping, crafting, snow (& moose!) oh my! used merely three colors, two embossing folders, some metallic ink, a dramatic pop of red... and a BOATLOAD of creativity and skill to make this amazingly serene piece of stamped art! displayed her electronic die-cutting virtuosity with this jaw-droppingly beautiful C&S masterpiece made using ONLY her cricut and two shades of cardstock!!! as always, we're thrilled to welcome old friends and new, and extend our sincere thanks to everyone who played along this week! 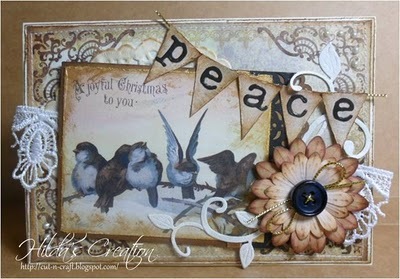 *DO* check out the peace on earth gallery for an outstanding amount of inspiration, then c'mon back at midnight for the next prompt!